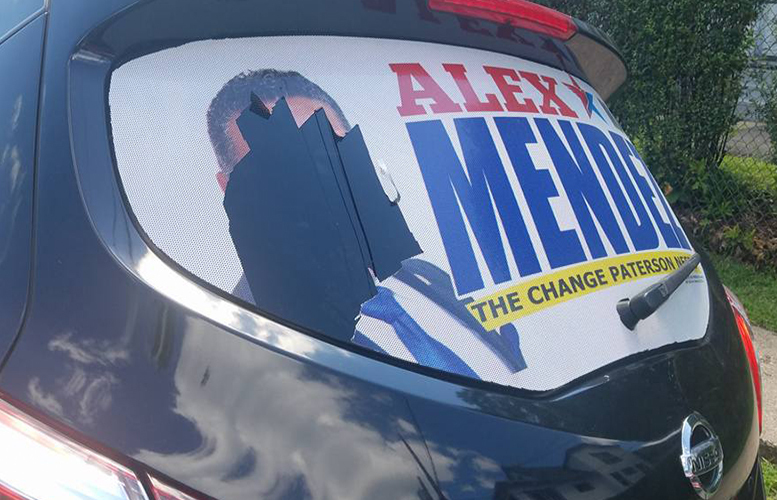 Five vehicles that had rear windshield clings showing overt support for councilman Alex Mendez’s mayoral run had their tires slashed and ads defaced, according to the at-large councilman. Mendez said a man and woman in a gold color Lexus SUV were caught on surveillance vandalizing the vehicles. He said the video captured by one of his supporter has been forwarded to police and the Passaic County Prosecutor’s Office. “We hope they catch the people that are behind this,” said Mendez on Tuesday morning. He called the tire slashing and defacing a “well planned” campaign aimed at intimidating his supporters. Mendez said vehicles were vandalized all over the city. East 24th Street, Sandy’s Court, and Oak Street are some of the areas where cars were targeted. “They are trying to hurt me, but are hurting hard-working families,” said Mendez. He said video footage shows the woman getting out of the vehicle at 5:30 a.m. stabbing car tires. There’s also a witness, he said. Video is time stamped Aug. 5, 2017. Mendez is paying to cover the repair expenses for the targeted supporters. So far, he has purchased 24 tires. When asked whether a rival political campaign was behind the vandalism, Mendez was reluctant to name any opponents. Mendez said he will wait on law enforcement to identify the suspects. His supporters are not the only ones to experience vandalism. Supporters of Pedro Rodriguez had their vehicles vandalized late last month. There were suggestions Mendez’s supporters were targeting Rodriguez’s supporters. Rodriguez said his supporters continue to be victims of vandalism. Both Rodriguez and Mendez are campaigning hard to capture the hearts and minds of the city’s largest Latino group: Dominicans. Both men hail from the Dominican community. The windshield clings damaged cost more than $100 each. Rodriguez said vandalism is costing his campaign great sums. Acts of vandalism – often theft or destruction of campaign signs – occur weeks before election; however, in this case, the election is nine months away. Rodriguez and Mendez both want the acts of vandalism to stop. It's long past due that city come under command and control of the national guard until the state takes over the corrupt, bankrupt, and lawless city. The poor residents have suffered enough! The police, short handed as they are, are doing all they could, but it's not enough. The mayor will start his sentence is Sept., he's already made his deal. He wasn't the sole problem, just another symptom of a long line of "what's in it for me" corrupt politicians.